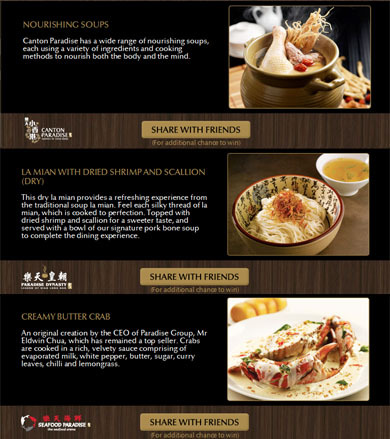 Singapore – Paradise Group Holdings, a home grown culinary brand with an extensive network of restaurants in Singapore, invites discerning diners to celebrate the many flavours of Chinese cuisine on social media. 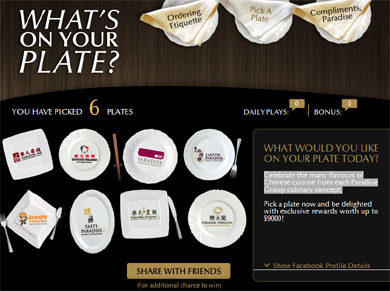 Conceptualised, deployed and managed by Singapore-based creative agency, noisycrayons, the campaign, named What’s on Your Plate?, rallies Singaporeans with a taste for good food to pick one of eight plates presented to them on their screen in a turn. Each plate represents one of Paradise Group’s eight culinary concepts and each click of a plate presents a delectable dish and instant dining rewards worth up to S$9,000. CEO of noisycrayons, Stefan Lim, explained that the socially driven campaign was positioned to focus on the desires of the contemporary diner to create delightful dine-out experiences for their loved ones. He pointed out that the creative team took pains to veer away from the conventional, and oft-adopted approach of being outright promotional. “Instead, we leverage on social media platforms such as Facebook to create heart-warming conversations around how the Paradise experience can apply to the creation of important social occasions and life events. In our minds, the best dine-out experience is about giving your loved ones, friends and members of your social network a good time and we want the campaign to showcase how diners can create ‘a taste of good life’ at Paradise restaurants,” he said. The campaign is expected to reach social-media savvy people with discerning tastebuds and an appetite for good Chinese dishes, as well as to increase and influence awareness of the intricacies and beauty of Chinese cuisine served by Paradise Group Holdings’ restaurants. The digital engagement initiative of Paradise Group Holdings, along with its associated digital advertising campaign, is managed bynoisycrayons, a Singapore-based digital creative agency and an affiliate of SPH Magazines.